Being a little limited on time, and rather than recreate the wheel - I decided I'd try out some project ideas that are readily floating around the net (see links below). 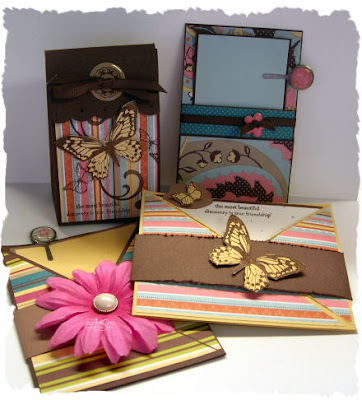 I got out my Embellishment Papers, and Rustic Artsy Swirl Stamp for my projects. Note - the sentiment on the box comes from Artsy Trinkets #1 stamp sheet. The awesome chipboard buttons that match the great Embellishment Papers can be found here. The cool Pebble Clips, stamps, embellishment papers, and chipboard buttons I used can be ordered here at Innovative Stamp Creations - just tell Betsy "Lisa sent you"! I used the same papers and the Rustic Artsy Swirl Stamps for this framed art, which was inspired by the Baroque Motifs piece I posted last week. 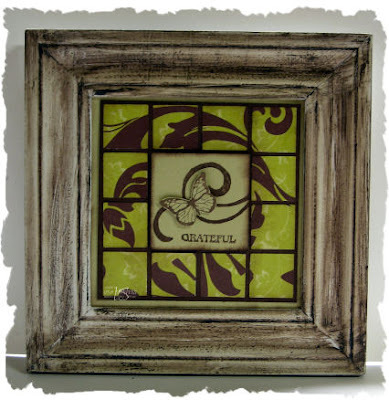 The frame I had in my stamping stash, but I needed to alter it, as the cream color just wasn't working. So, I got out my Ranger Acrylic Expresso Dabber, dabbed it onto my frame, let it sit a minute, then wiped it off. You can order the Acrylic Dabbers at Innovative Stamp Creations. WOW those are all fantastic projects!! Love how you changed the frame with a little Ranger Ink! Beautiful! I have to say that butterfly set is jaw dropping! I love it. You really did that paper justice! I didnt want it till I saw your set! LOL!